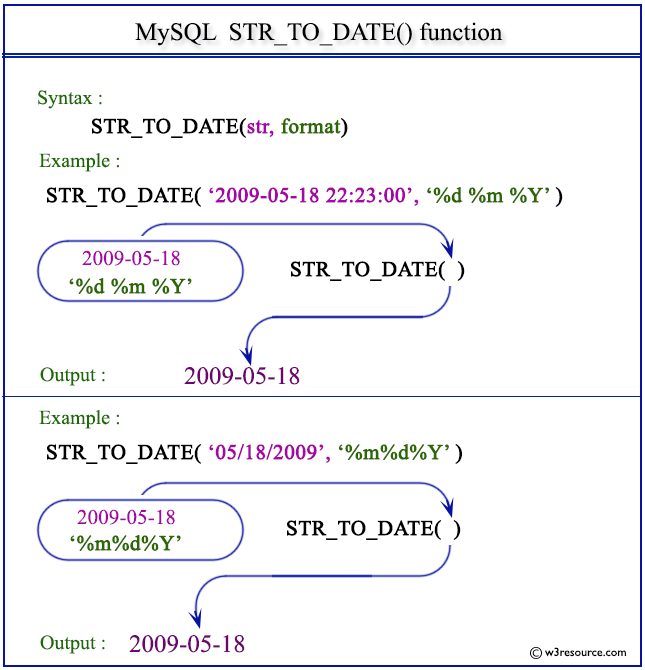 MySQL STR_TO_DATE() returns a datetime value by taking a string and a specific format string as arguments. If the date or time or datetime value specified as a string is illegal, the function returns NULL. The format specifiers have been described in DATE_FORMAT() work with this function also. The following statement will return a valid date from the given string 18,05,2009 according to the format %d,%m,%Y. The following statement will return a valid date from the given string May 18, 2009 according to the format %M %d,%Y. The following statement will return a valid date from the given string 05/18/2009 according to the format %m/%d/%Y. The following statement will return a valid time from the given string 11:59:59 according to the format %h:%i:%s. The following statement will return NULL because the format specifier %h %i %s (HOUR MINUTE SECOND) is not compatible with the contains of the string 11:59:59 (HOUR:MINUTE:SECOND). The following statement will return a valid datetime from the given string Monday 15th September 2008 22:23:00 according to the format %W %D %M %Y %H:%i:%s.